Koreatown (Hangul: 맨해튼 코리아타운) is an ethnic Korean enclave in Midtown Manhattan in New York City, centered on West 32nd Street between Fifth Avenue and the intersection of Sixth Avenue and Broadway, which is known as Greeley Square. Historically, Manhattan's Koreatown has been part of the Garment District. Koreatown is primarily a Korean business district, but the neighborhood has experienced an increase in Korean and European traffic as well, and the resident Korean population in the area has grown concomitantly. There was never a formal plan or agreement to create a Korean commercial district in Manhattan. However, given the high tourist traffic stemming from nearby Midtown Manhattan landmarks like the Empire State Building, Macy's Herald Square, Penn Station, Madison Square Garden, the Garment District, and the Flower District, it was a convenient location for Korean immigrants to settle. Initiated by the opening of a Korean bookstore and a handful of restaurants in the 1980s, Koreatown sprang into being. With their success, an additional stream of Korean-owned businesses took root in the neighborhood, coinciding with increased immigration from Korea; and with rising demand for the prime location, overall property values in the area increased as well. According to the 2010 United States Census, the Korean population of Manhattan (co-extensive with New York County) had nearly doubled to approximately 20,000 over the decade since the 2000 Census. Along with the Koreatowns in nearby Bergen County, New Jersey (in Palisades Park and Fort Lee) and Long Island (extending eastward from Flushing, Queens) in New York, Manhattan's Koreatown serves as the nexus for an overall Korean American population of 218,764 individuals in the New York City Metropolitan Area, the second largest population of ethnic Koreans outside of Korea. The heart of Koreatown is the segment of West 32nd Street between Fifth Avenue and Sixth Avenue, officially nicknamed Korea Way. Korea Way features stores and restaurants on multiple stories, with small, independently run establishments reaching up to higher floors, exuding an ambience of Seoul itself. The New York City Korean Chamber of Commerce estimates there to be more than 100 small businesses on Korea Way. Korea Way features numerous restaurants that serve both traditional and/or regional Korean cuisine and Korean fusion fare (including Korean Chinese cuisine), several bakeries, grocery stores, supermarkets, bookstores, consumer electronics outlets, video rental shops, tchotchke and stationery shops, hair and nail salons, noraebang bars, nightclubs, as well as cell phone service providers, internet cafés, doctors' offices, attorney offices, banks, and hotels. Approximately fifteen 24/7 restaurants conduct business on Korea Way. Although Korea Way continues to represent the heart of Koreatown, situated between Broadway, Sixth Avenue, and Fifth Avenue, Koreatown itself as of early 2015 has been expanding further eastward from Fifth Avenue along East 32nd Street, toward Madison Avenue in Midtown Manhattan. Approximately fifteen 24/7 restaurants conduct business on Korea Way. As commercial rents have risen, more Koreatown restaurants have had to maintain a 24/7 presence or to expand in size to make their operations financially viable. Historically known as a more tourist-oriented alternative to Flushing and Murray Hill, Queens in the nearby Long Island Koreatown, Koreatown in Manhattan has since developed a reputation as an authentic Korean dining destination. ^ a b c d e Baldwin, Deborah (October 17, 2008). "Living In Koreatown Exotic Flavor, Beyond Just the Food". The New York Times. Retrieved October 4, 2013. ^ "New York County, New York QuickLinks". U.S. Census Bureau. Retrieved 2012-05-21. ^ "Profile of General Population and Housing Characteristics: 2010 Demographic Profile Data New York-Newark-Bridgeport, NY-NJ-CT-PA CSA". U.S. Census Bureau. Retrieved 2012-06-29. ^ Chi-Hoon Kim (2015). 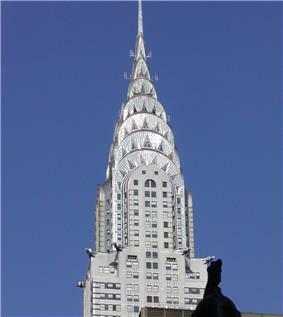 "Savoring Gotham: A Food Lover's Companion to New York City: A Food Lover's...page 326". Oxford University Press, Google Books. Retrieved October 11, 2015. ^ Rebecca Finkel (2012-06-20). 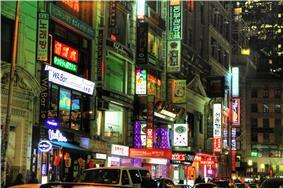 "Seoul-searching in Manhattan’s Koreatown". Copyright 2001-2012, Free Daily News Group Inc. Retrieved 2012-10-03. ^ Yi, David (3 October 2010). "Your Nabe: From barbecue to karaoke, your guide to Koreatown". ^ Andrews, Betsy (22 March 2011). "Snacking in Koreatown". The New York Times. Retrieved 13 April 2011. ^ Nick Fox (2011-03-22). "Koreatown: Where to Eat". The New York Times. Retrieved 2012-10-03. ^ "Serious Eats New York: Manhattan: Koreatown". Serious Eats ©2006-2012. Retrieved 2012-10-03. ^ Jenny Miller (2011-12-22). "First Look at Dong Chun Hong, Bringing Seoul-Based Korean-Chinese to K-Town". Copyright © 2009, New York Media LLC. All Rights Reserved. Retrieved 2012-10-04. ^ Feldman, Zachary (2010-11-26). "In The Midnight Hour: BCD Tofu House in Koreatown". Retrieved 2011-09-25. ^  Shinhan Bank America. Accessed April 18, 2015. ^  Don's Bogam Korean restaurant. Accessed April 18, 2015.